This week marks the fifth anniversary of the E7-NowAndThen blog, during which time we have published a little over 200 articles, on a ratio of about 1:2 - Now:Then. This article is a brief review of the past, with some pointers to the future direction of the blog. First, the stats. The site has had just short of half a million visitors and now attracts an average of well over 400 hits a day. The complementary twitter account @E7_NowAndThen has a little under 1700 followers and is happy to re-tweet anything interesting about E7. The articles receiving most hits, unsurprisingly, are those that have been live longest. The most popular tend to be about the "Now" rather than the "Then", and at the pleasure seeking end of the scale of topics covered. Survivor's tale - Forest Gate Industrial school - here. The Criminal Landlords post received the fastest hit rate in the shortest period of time on the blog - racking up over 2,000 hits in its first week live. Some of our most successful, and satisfying, posts (particularly the Dames Road disaster and Survivor's tale, above) have been when we have been contacted by witnesses or descendants of participants of significant events and have been able to shed a new light on an older story, and added to the depth of understanding and authenticity of local events of historic importance. Similarly, over the last couple of years, we have been able to produce ground-breaking biographies of a number of local people - adding to our, and other historians', understanding of them as individuals - by pulling material, some very local, together in ways never previously done. So, we have added to the appreciation of a number of people normally confined to footnotes in more general histories. 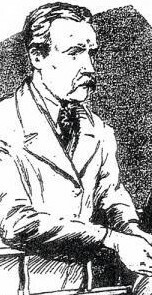 We are particularly pleased to have been able to achieve this with Frank FitzGerald, Irish patriot and father of one of the country's recent taoiseachs (Garret) - see here, anarchist and some-time William Morris associate, Charles Mowbray - see here. These were largely put together by local historian, @Flatshistorian, Mark Gorman. 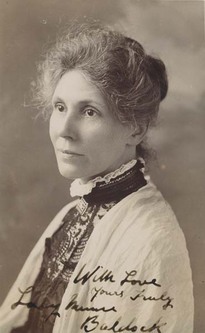 Most recently our biography/timeline on local suffragette, Minnie Baldock, did precisely this as well (see here). For the future, we will be looking to build on some of these historic successes. So - next week's post will continue the survivor's tale tradition, by telling the story of one of the witnesses of the bombing of the Princess Alice, in 1941 - the still very much alive John Muskett. We are now working in collaboration with outside bodies, contributing to, and delivering, larger and more ambitious projects. Thurs 26 April 8pm - free! Another collaboration project is with the family of William Edward Wright. 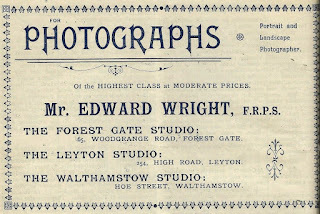 He was a prominent Forest Gate-based photographer working in the latter years of Victoria's reign and throughout Edward V11's. 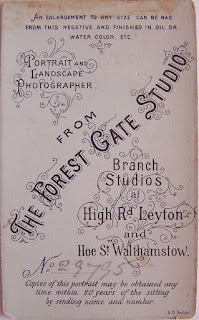 He had eight studio branches in total, including two in Forest Gate. 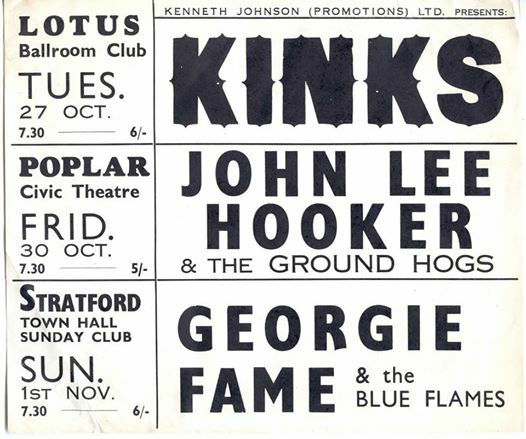 We will be publishing a blog about the man in a few weeks, and hope to put on an exhibition about the man and his works, in co-operation with his family, later in the year, in Forest Gate and elsewhere, . This follows the collaboration we had last year with Paul Romaine, in putting on his exhibition on The Upper Cut, as part of Newham's Heritage Week. See here for subsequent post on this blog. 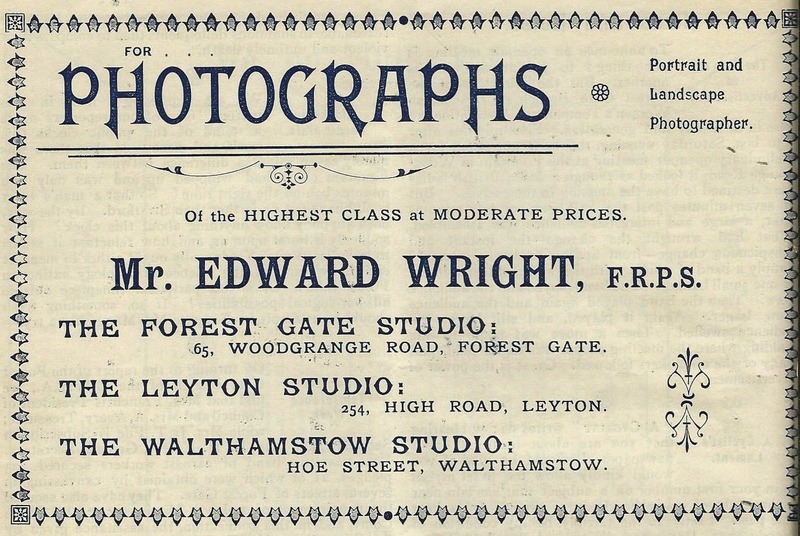 Wright, the photographer - blog and possible exhibition pending! We have written extensively about bike building and pleasure in Forest Gate at the turn of the 19th/20th centuries (here, here and here). We are working with Boneshaker magazine to publish lengthy, and to them and us an important, article on this significant industry and leisure activity locally - later in the summer. Layers of London is a lottery-funded history initiative sponsored by the Institute of Historical Research at University College, London. Theirs is a three year project which aims to display London history via a digitised map foundation, so that visitors can - by clicking on a pointer on the modern map - access the history of that spot and events that took place in or around it. It will also be possible to see how the immediate area has changed over time, by examining different era maps of the locality and "drilling" though them. 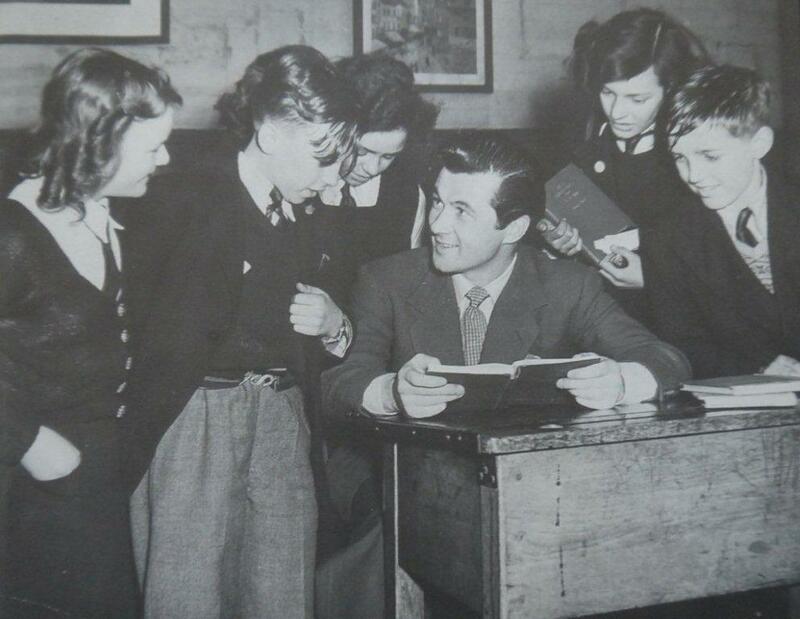 Our features on local street histories (e.g Capel, Sebert Dames, Woodford Roads and Earlham Grove), written by local historian, Peter Williams, will be particularly valuable for this initiative. 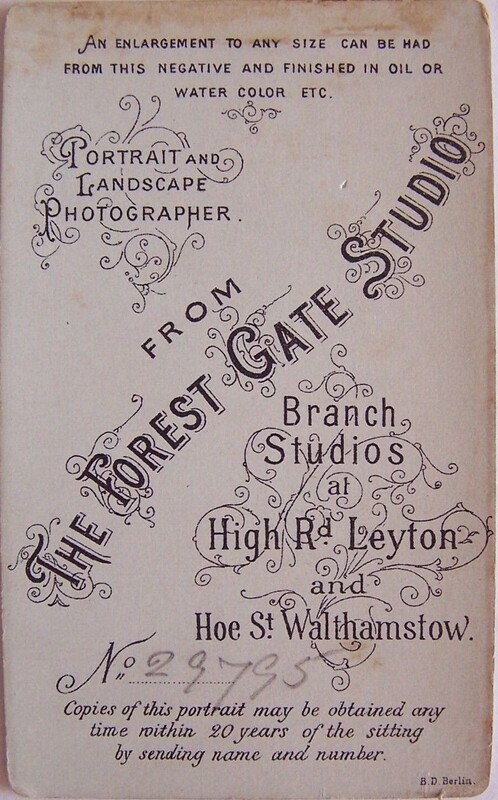 We will be contributing to this project and by the time it is officially launched in June it will be possible to access over 100 aspects of Forest Gate history on it. 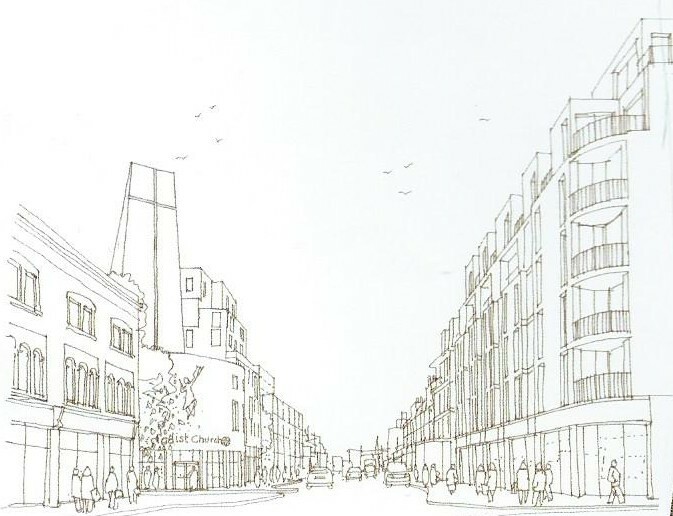 As far as the "Now" aspect of the website is concerned, we will continue to cover major planning and development activities affecting Forest Gate, and offer the opportunities for people to engage in a discussion on the proposal. 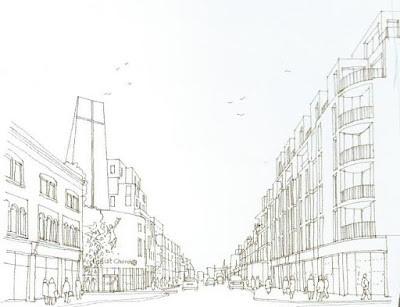 A good example of this would be our article on the development plans for 39 -49 Woodgrange Road (see here), which has had almost 4,000 hits and attracted over 40 comments in the two years since it was first posted. We will also dig out E7 angles on Newham-wide, or national surveys and statistics - often being able to throw up major talking points - as our regular food hygiene surveys and recent surveys of crooked landlords and lettings agencies have. We are always open to receiving contributory posts, or suggestions of areas to research and publish - subject to legal and decency considerations. Thank you for supporting this blog over the last five years. We hope you can join us in looking forward to the next five!